The 4th Annual Urban Land Institute (ULI) Florida Summit will be held Thursday, June 4, and Friday, June 5, at the Sawgrass Marriott Golf Resort & Spa in Ponte Vedra Beach. Sawgrass Marriott Golf Resort & Spa announces the addition of Paula Safran and Deborah Wallace as new directors of national accounts for the resort. Safran and Wallace will be responsible for business development in the area of meeting and convention planning. Congratulations to the chefs at the Augustine Grille at the Sawgrass Marriott Golf Resort & Spa on the resort’s recent “Snail of Approval” award by the First Coast chapter of Slow Food USA. The Snail of Approval program recognizes restaurants, artisans, stores, markets and farms that contribute to the quality, authenticity and sustainability of the First Coast region’s food supply. The Sawgrass Marriott Golf Resort & Spa recently donated more than $2,500 to the Northeast Florida Chapter of the American Red Cross for its earthquake relief fund. The resort’s executive team presented a check to Jack Morgan, chief executive officer of the Northeast Florida Chapter of the American Red Cross, and Rusty Russ, chapter volunteer. The chefs at the Sawgrass Marriott Golf Resort & Spa’s Augustine Grille have unveiled a new menu using all-natural, seasonal and sustainably-grown products and are receiving rave reviews from guests. The menu, designed by Executive Chef David Scalise and Chef de Cuisine Brett Smith (above), compiles selections from local and regional farmers and artisans such as heirloom fruits and vegetables, locally caught seafood, specialty cheeses, and dry-aged beef. The Sawgrass Marriott Golf Resort & Spa, recently named by Parents.com as one of the Best Beach Resorts for Families, is offering a new “Stay Together, Play Together” Family Vacation Package. This great summer deal gives families a $100 credit per night at the resort, which can be used towards any of the resort’s many golf, restaurant and spa amenities. One of the nation’s highest rated hotels for relaxation and spa services is located in Northeast Florida. The Sawgrass Marriott Golf Resort & Spa in Ponte Vedra Beach was recently ranked 7th among the Top 10 Best Relaxation/Spa Hotels in North America by the readers of TripAdvisor®, the world’s largest and most trusted source of travel advice. 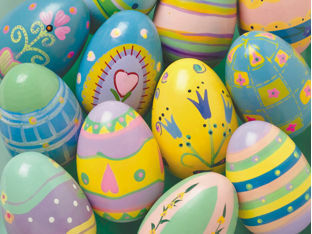 Hop on Over to Sawgrass Marriott for Easter Brunch!